After two very positive weeks, this week the high frequency data was much more mixed. As Bill McBride at Calculated Risk pointed out in a must-read post this week, the biggest part of the existing home sales decline is due to a drop in distressed housing sales (fewer and fewer firesales as a result of stretched homeowners) while the percentage of sales that are conventional is on the rise. So this is a good sign. And even new home sales/housing starts (which are off to a sluggish start this year) should be up nicely for the year as a whole. Seriously, Joe? Housing starts don't matter? 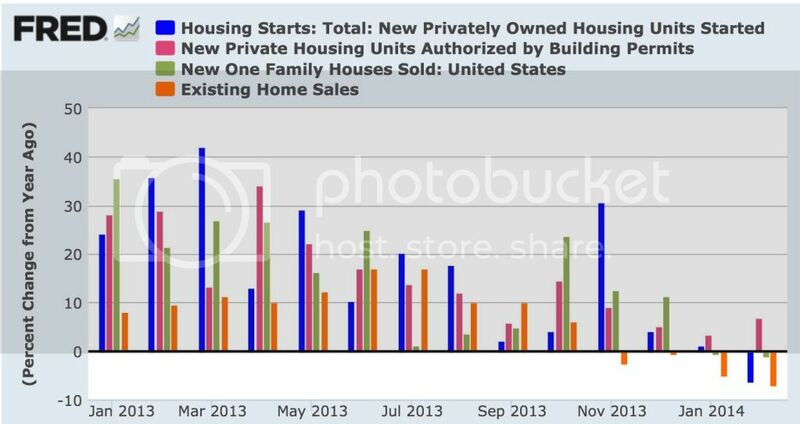 New home sales don't matter? While starts typically follow the pattern for permits by a month or two (so I am expecting a big YoY gain in starts next month, given their horrible April 2013 number, and as they catch up with permits), new home sales are just as leading as housing permits. And the piece Joe cites from Bill McBride was written the day before the awful March new home sales came out. Here we are, 1/4 of the way through 2014, literally every metric is down YoY except permits, the concerns are sufficient enough that the title of Joe's piece is Is it Time to Freak Out about Housing? and his only cite is to the forecast of an average monthly gain of 20% YoY. How's that working out so far? Gee, on the other hand, did anybody say the housing market was going to run into these problems? Anyone at all? Now I know how Rodney Dangerfield felt. I tell ya, I don't get no respect. Earlier this week there was a post at another site about the "rental affordability crisis." Claiming there was a bubble in rents as well as housing, the writer called me out by link for my ridicule of Doomers who see a bubble every time a metric goes up. HIs analysis of the issue was wrong. The shame is, he highlighted a real, serious problem. But in his zeal to find yet another bubble, he overlooked the real story, of how declining real wages in the two lowest quintiles have created real hardship for renters in that group. "Things are expected to continue getting worse, as rents will outpace the rate of inflation (not to mention incomes) for years to come." Note that from 2000 to 2009, real median rents rose 17.8%, from .84 to .99 of wages. 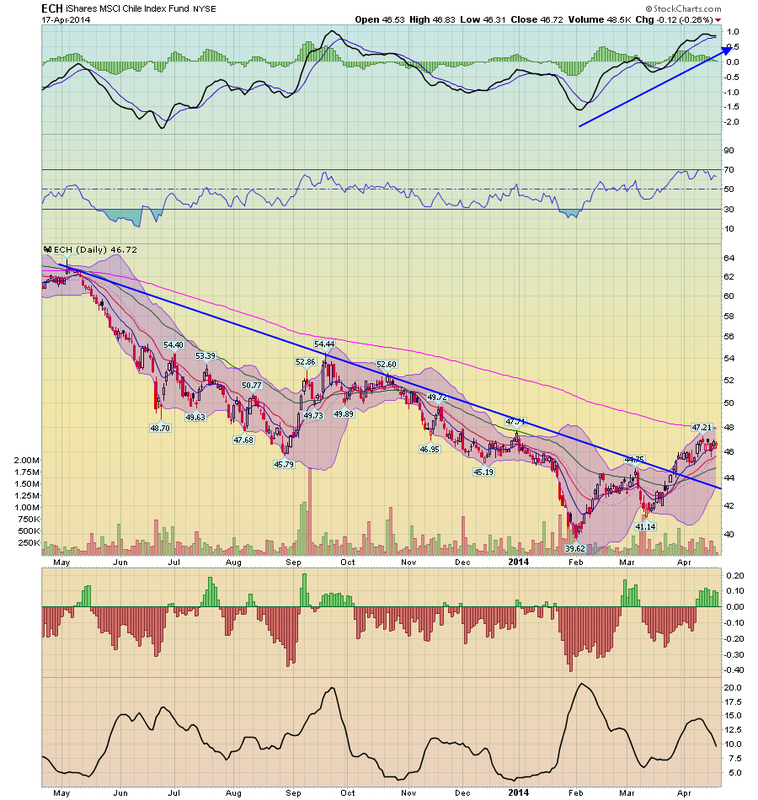 By January 2013 that was back down to .93, but by the end of 2013 had risen to .95. The final column above shows "real" asking rents (rents deflated by the CPI), and indicates that rents haven't even kept up with inflation for the last 5 years (although they increased more than inflation in 2013). 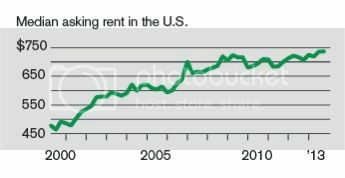 There simply is no bubble in rents. So what's the big deal? 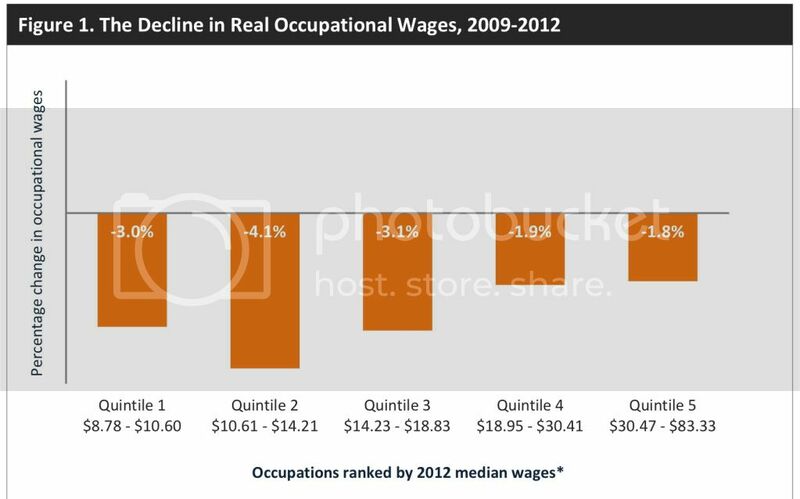 The problem is that, while median wage earners aren't having a problem, the decrease in real wages in the bottom two quintiles is putting them in a real bind. According to data from the U.S. Census, half of all renters, and 83 percent of renters with incomes under $20,000, paid more than 30 percent of their incomes in rent in 2011. ... [But i]ncome growth has failed to keep pace with rental growth over the last decade. At the national level, between 2000 and 2011, growth in REIS rent exceeded the growth in median renter income by the affordability rate to fall further. Instead, the greatest decline in affordability has occurred amongst low-to-middle income households. [For example, i]n Atlanta, the share of households with incomes between $20,000 and $35,000 in year 2010 dollars who paid at least 30 percent of their incomes in rent rose from about 20 percent in 1980 to more than 80 percent in 2012....Even households in the $35,000 to $50,000 real income tier have experienced declining affordability rates, albeit not to the same degree....However, the highest income groups in the data – households making $50,000 or more in real terms—have experienced little decrease in affordability. In other words, the problem isn't a bubble in rents. The problem is that even when rents have not kept pace with inflation, the income of the typical household that rents has experience a real decline. The Harvard Joint Housing Center points out [pdf] that in 2010, 70% of all rental households had below the median of household income, and 40% of renters were in the in 25% of household income. A recently released study by the Harvard Joint Center for Housing Studies noted that "Between 2000 and 2012, real median rents rose nationwide by 6%. However, over the same time period, the real median income of renters fell by 13%." In other words, even though rents have failed to keep up with inflation since 2008, and even if they have declined as to real median weekly wages since then, they have continued to increase in real terms compared with the falling real incomes of the bottom two quintiles who make up the typical renter household. Rental prices have failed to go up more in the last several years not because of a lack of demand, but because higher rents are simply out of the reach of the typical renter. It's a shame that the writer of that piece was so focused on the idea that there must be a bubble in rentals and housing that he completely overlooked this very real problem. 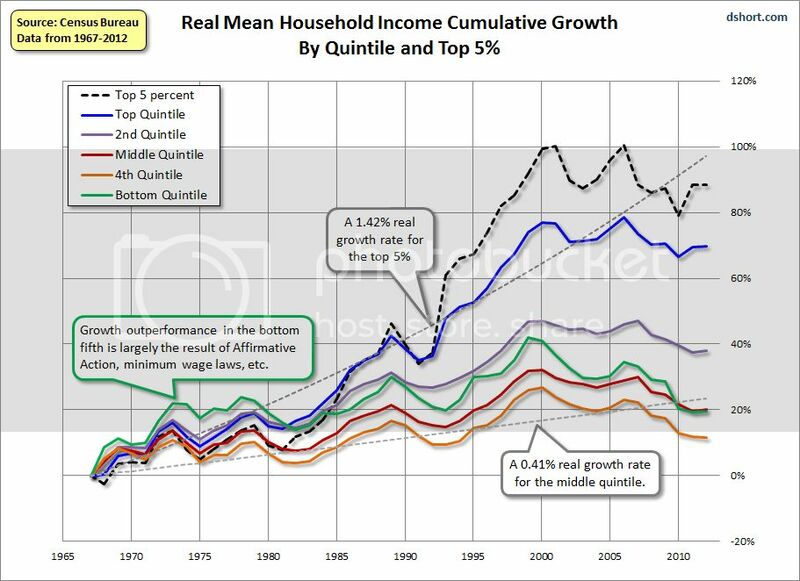 It demonstrates in yet another way that falling real incomes among the lower middle class and working class are destroying the American dream. 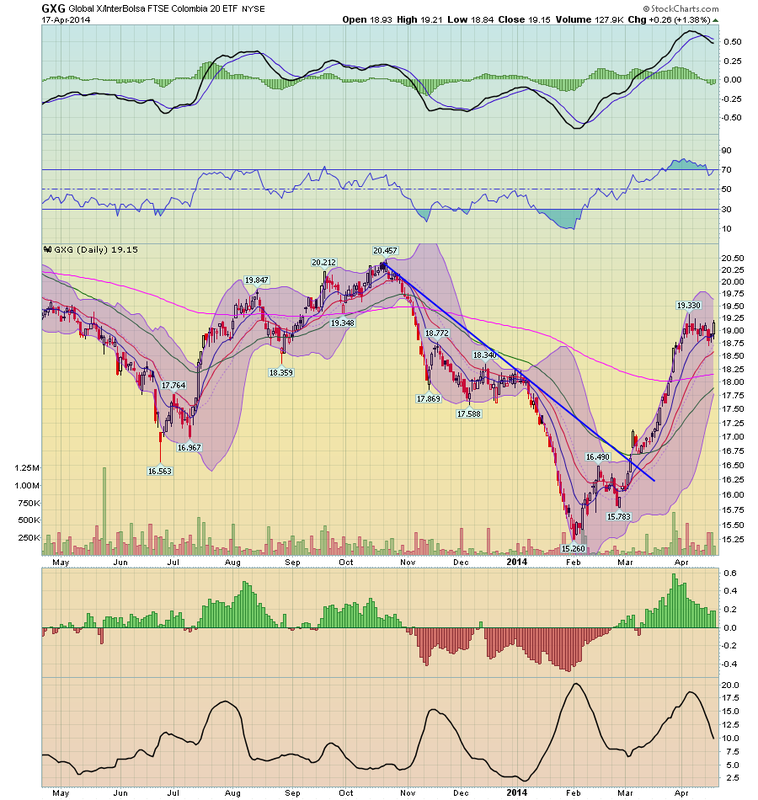 All of the coincident indicators are still increasing. 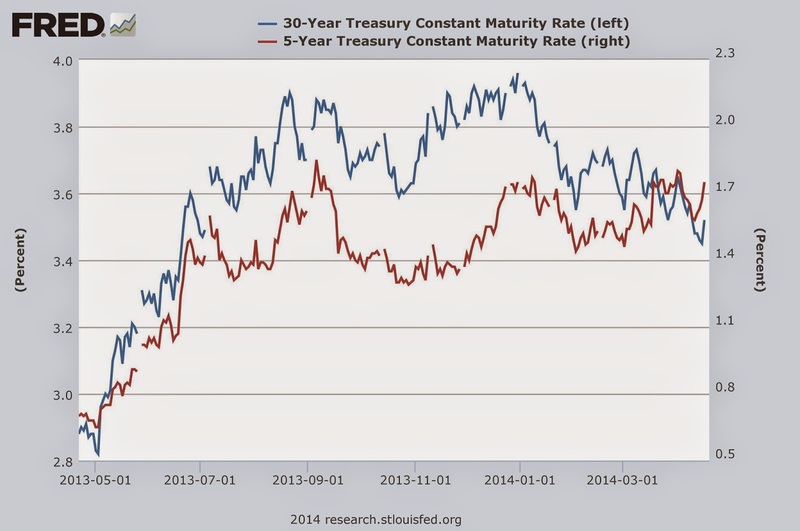 Above is a chart of the difference between the 30 and 5 year CMTs -- constantly maturing treasuries. Since the beginning of December, this spread has been declining. The reason for the decrease is a rally in the long-end of the curve as the 30 year CMT has decreased from ~ 3.9 to ~3.5, or a decrease of about 40 basis points. 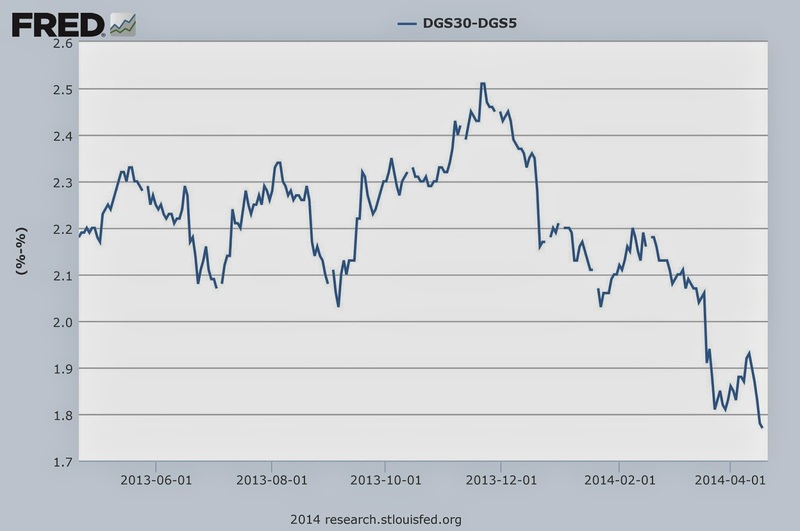 That tells us that traders don't see inflationary pressures. 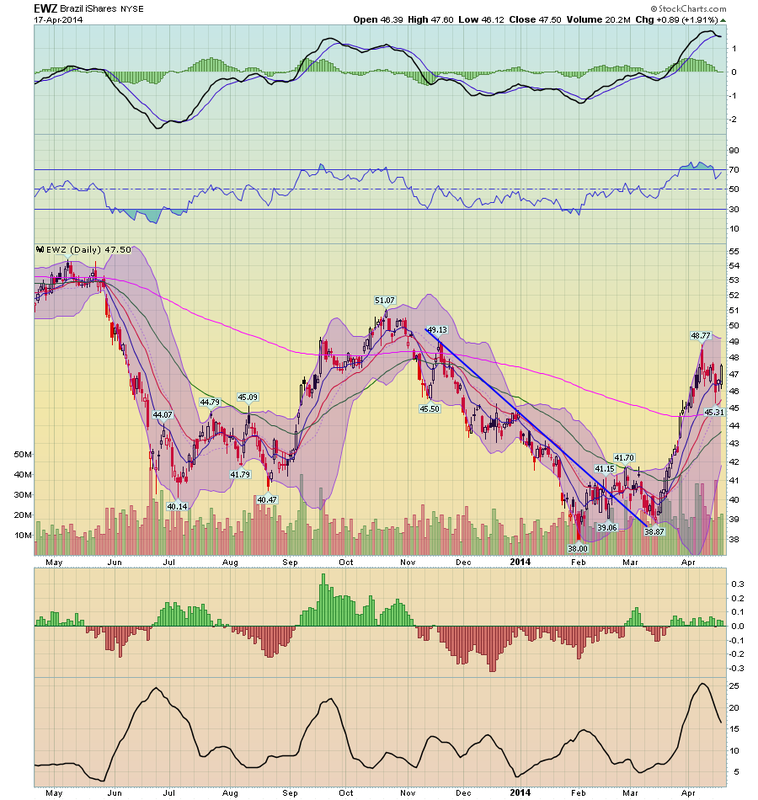 When the Fed announced an end to the quantitative easing program, the treasury market sold off. The reason is simple: the largest buyer of treasuries had announced they were leaving the market. 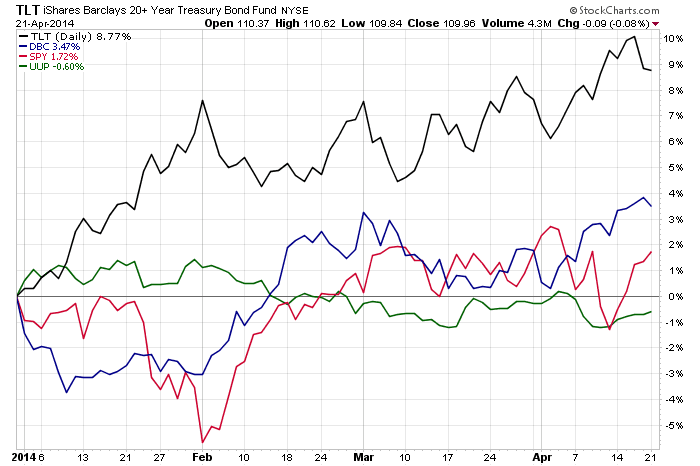 However, since January 1, treasuries have outperformed the market as a whole. When we compare long treasuries, SPYs, commodities (DBC) and the dollar (UUP) since January 1, treasuries again outperform. One of my key mantras is that I don't fight with the data. Sometimes there is an obvious asterisk (e.g., the government shutdown, or particularly severe weather, e.g., Sandy), but as a general rule trying to make the data fit your worldview will lead you astray. Last year I pointed out that on 15 of 19 occasions in the last 60 years, when there had been a 1% increase in interest rates, housing permits had decreased YoY by at least -100,000. One time, in 2000, permits decreased only -62,000. The three remaining times appear to be cases of "buy now or be forever priced out," in which the housing market levitated for awhile, and then crashed all the harder. 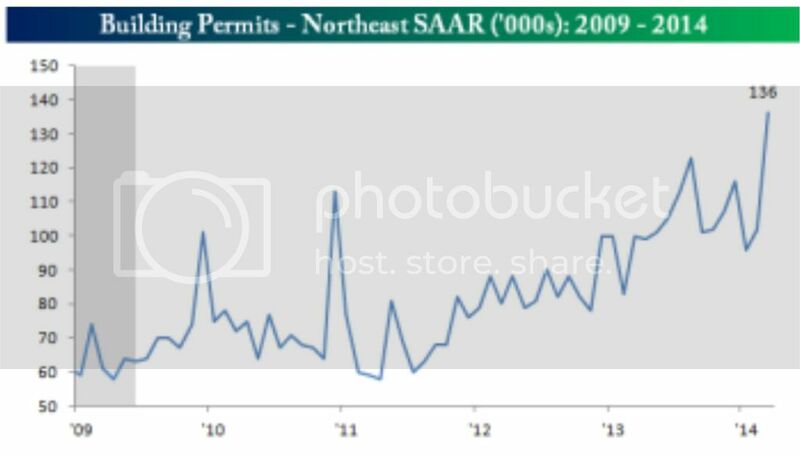 While permits have certainly decelerated, they have resolutely not turned negative, something that I absolutely thought would have happened by now. So why have permits held up? A lot of the data is exactly what I'd expect to see as permits roll over. And there are reasons to think that the tow month YoY increase in permits might be an artifact of the unusually severe winter. 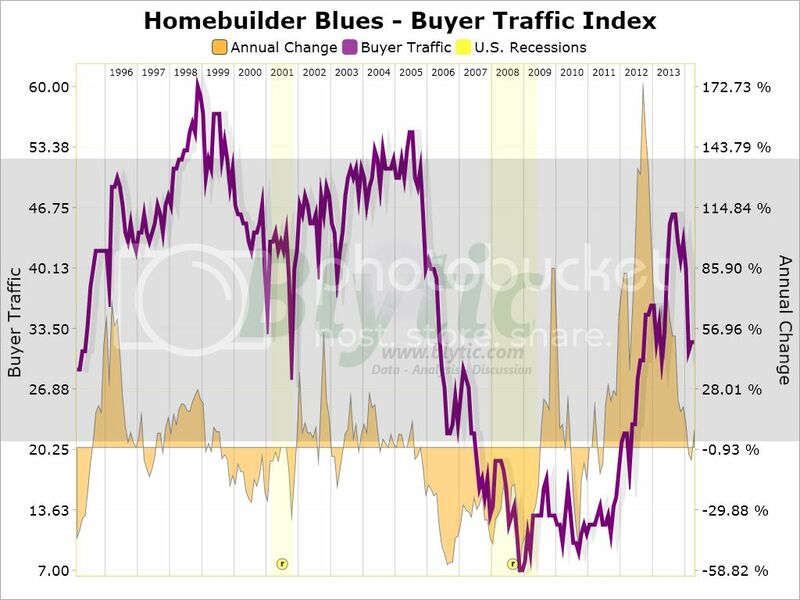 Note that the two generally move in the same direction, and homebuilder sentiment has decreased in the last few months. Buyer traffic appears to have decreased in the last few months, and is now basically flat YoY. 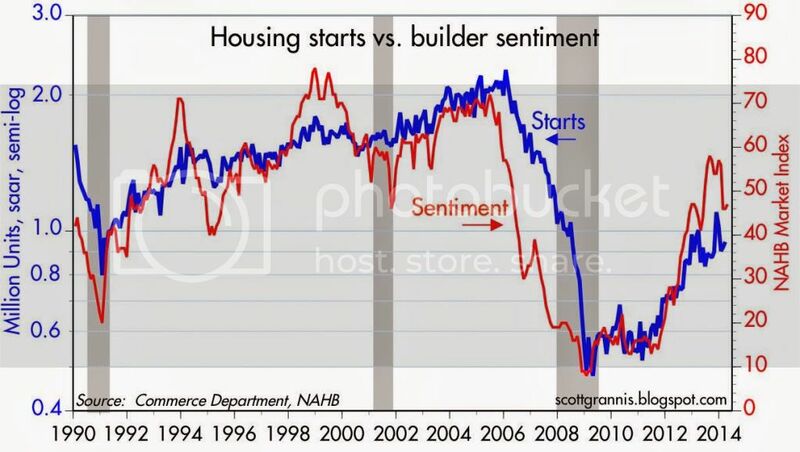 This certainly does not look like what I would expect to see if there were to be an increase in housing starts or sales. It looks pretty clear that there were several months of depressed winter data, followed by a huge rebound as the weather broke in March. Although I won't post it, a similar but smaller rebound occurred in the Midwest, while the South was negative YoY in March. So there is reason to believe that the increasing trend in permits YoY since January might be an artifact of the unusually severe winter. 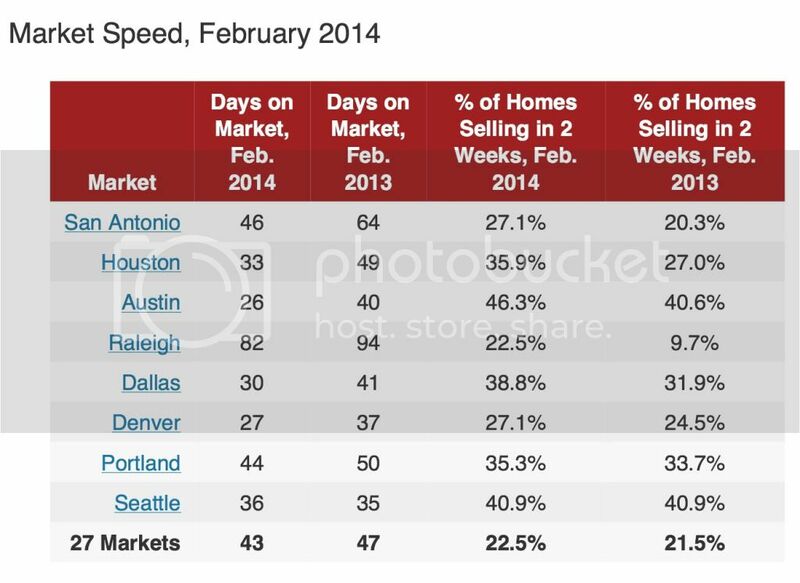 While the housing market has cooled in many major cities since last year, other cities have only gotten hotter. In certain areas of Texas, North Carolina, Colorado and the Pacific Northwest, homes are selling like hotcakes thanks to strong job and population growth, worsening inventory shortages and ... relative affordability. If there is a migration from high-priced to low-priced housing markets, this could be ameliorating the increase in mortgage rates. Yet another factor may be the changing rent-vs.-own ratio. According to the US Census Bureau (pdf), while housing prices declined by about 1/3 from top to bottom, and have made up less than half of that decline since, median rents have remained within 5% of $700 per month since 2008. In the last few quarters of 2013, they rose to the top end of that range. In metro areas with relatively expensive rentals, buying a house may be more attractive. In the 1960s, 5 months supply was enough to bring prices increases to a halt. In the 1970s and 1980s, it was more like 7 months. In 2006, it was between 5 and 6 months' supply. 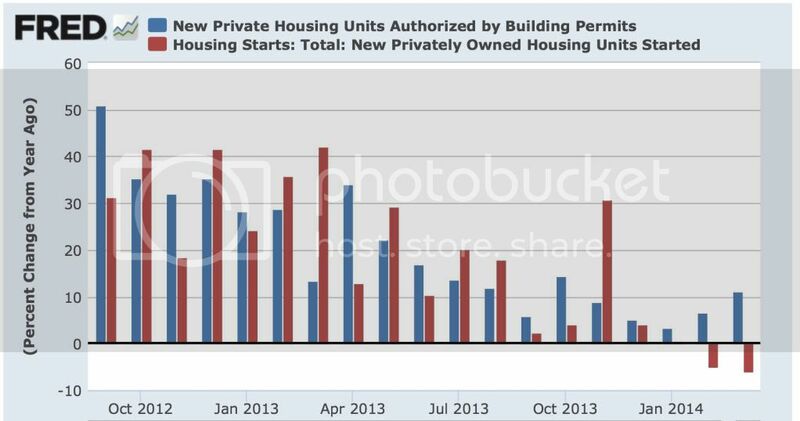 April and May of last year were particularly strong months for housing permits. If they are going to turn negative, those are the months where they should do so. If double-digit price increases continue, and affordability rapidly declines, then as with the prior 3 occasions, delaying the day of reckoning will only make it a harder fall. So tomorrow and Wednesday, I will be paying particular attention to the median price months' supply of both new and existing homes. Is there evidence that the market has not withstood the most recent price increases? In the case of new homes, there is already evidence that there has been a peak, and YoY price increases may have ended. Is the months' supply steady, or is it increasing further? 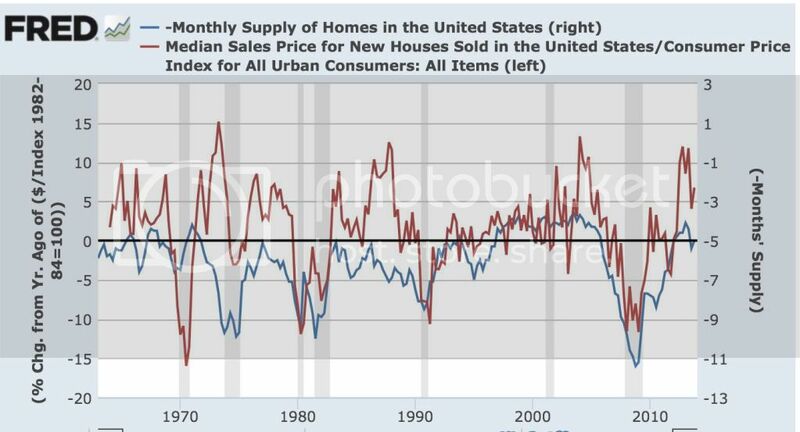 An increase in the months' supply is evidence supporting that there is or shortly will be a pullback in building. Latin American markets sold off in tandem when the Fed announced the end of QE, which basically reversed the flow of "hot money" funds leaving the US into development markets. Also hurting these economies is the Chinese slowdown, as many of these countries supply raw materials to the Chinese economy. But LA has made some impressive strides in its own right, which were heavily discounted in the sell-off. 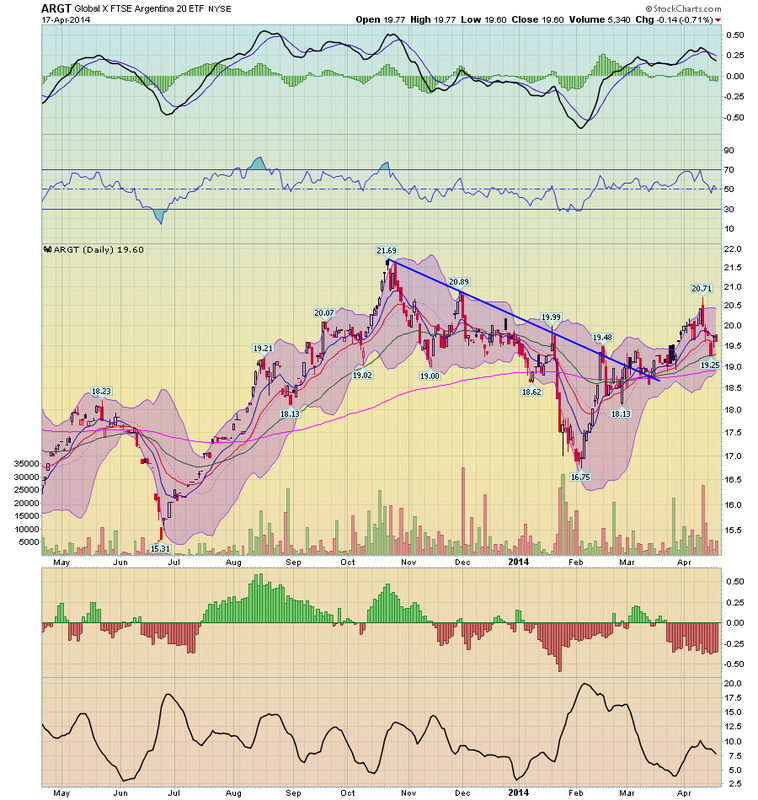 Traders have obviously reassessed these markets and are again committing funds. Chile and Colombia are understandable bets; both countries are on fairly decent economic footing. Brazil is a bit more of a puzzle, as there hasn't been much good news from that country since the first of the year. And Argentina has some issues, especially with its publicly released economic numbers that make me question its market strength. 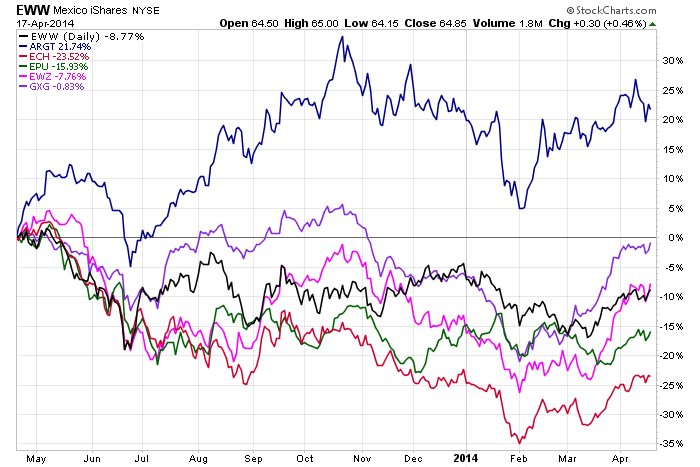 Here's a chart of the regions performance over the last year. Bonddad's weekly international summary, below, is well worth a read at XE.com. In it he describes the deflationary danger of the pro-creditor/pivot to austerity choices that were made in the developed world. in such a situation falling wages and prices or inflation at slower-than-expected rates is likely to worsen economic performance by encouraging consumers and investors to delay spending, and to redistribute income and wealth from higher spending debtors to lower spending creditors. In 2008-09, we could have bailed out debtors, or we could have bailed out creditors. Had we bailed out debtors, the debtors could have used that bailout money to renegotiate, pay down, or pay off their debts to the creditors, and then both would be made reasonably whole. Bailing out creditors rescued them, but didn't cancel the debt, and so debtors still had to deleverage and pay off the debts, a painful and slow process. At that critical juncture, none other than Larry Summers had the most powerful position possible to argue in favor of bailing out debtors, but did not do so. We chose creditors, and we've been paying the price since.